How good are your Pokémon? Would you like an appraisal by an expert? Well, we don't have any of those. 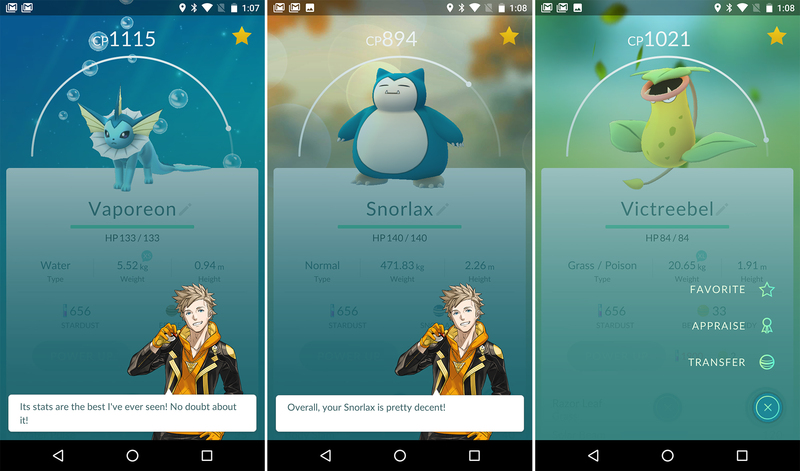 The best you'll get are some vague statements about stats from your virtual team leader in the new Pokémon Go update. Niantic totally promises it's working on more things, though. Here's the changelog for the latest Pokémon Go update. Let's take a moment to acknowledge that Niantic actually added a promise that it is working on new features in a changelog. That's not what a changelog is for. At any rate, the big addition this time is Pokémon appraisals, which you access from the menu button in the corner. Your team leader will tell you what up with your Pokémon, but it's really not very helpful. Appraisals are basically just a recitation of the Pokémon's stats and potential to be upgraded. The appraisals are sometimes rather disjointed, with one frame saying you need to improve your Pokémon and the next saying it has the best stats ever. You can grab the update from APK Mirror if you need to get a Pokémon appraisal ASAP. Otherwise, it'll hit your device in the coming days.